I have a new video for you guys since this has been a wildly popular recipe over the last few years and because it is so timely for me right now. If you follow me on insta-stories then you know that Pete and I are in the middle of a WHOLE14 (lol- we only have two weeks in us right now! )This is exactly what I am going to be making this weekend, and I wanted it to be on your radar too! Happy Friday!!! We have a really busy weekend coming up and Pia has her second Portland Fencing tournament weekend in a row. These tournaments actually really take SO much energy (her poor little body is always exhausted and she soaks through all of her clothes with sweat- its crazy!) so I always feel like she needs a really good breakfast before making the drive to Portland. Considering she likes to eat vegan, and has a million a food allergies, this is an awesome answer! I love homefries or hashbrowns in pretty much any form and these are no exception! I also love that this breakfast skillet is loaded with vegetables and tons of flavor, so that it will not only keep her full and provide her with great nutrition- but it tastes good!!! Looks like a delicious and hearty breakfast! I want to wake up to this skillet this weekend! I would never need the meat in this…such a beautiful, filling meal! 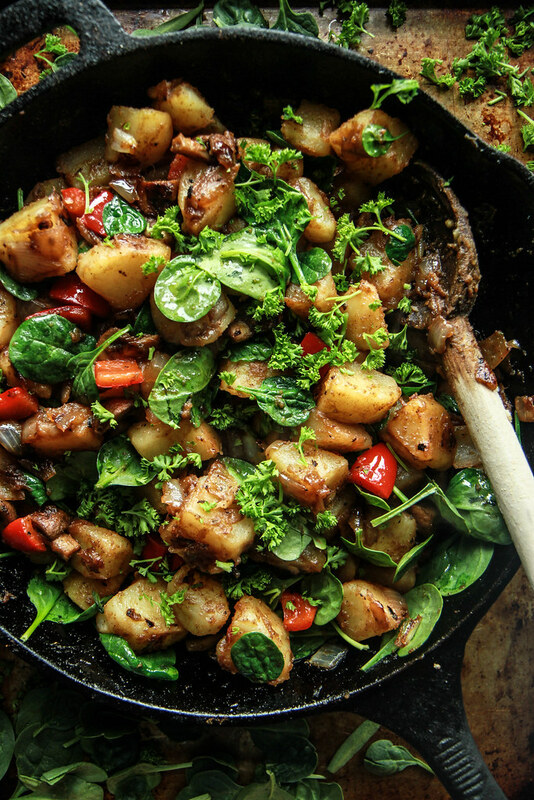 I love how vibrant and green this breakfast skillet is! This is my second day trying vegan recipes, and I am so glad I found this one!! This breakfast skillet was DELICIOUS! Very flavorful! I look forward to trying more of your recipes! Awesome Stephanie!! So happy to help! Looks delish except 4 the vegetable pil. Im making this tomorrow but will use extra virgin pmolive oil. So very much healthier! I just made this for lunch, tweaked it a bit by using half sweet potatoes and half white….it is sooo delicious! Plan to have it again for dinner, maybe with a couple of over easy eggs on top with some avocado slices!! Thank you, Heather!! January 11, 2018 at 12:53 pm	 Whitney T.
Great recipe!!! Tried it today. Awesome. Thanks for sharing.. .. ..
Pingback: 20 Tasty Vegan Recipes That Will Make Your Taste Buds Very Happy! Love this recipe. I made it with sweet potato’s so yummy thank you. Love those colors! Will definitely make that salad. Pingback: Here's 21 Breakfast, Lunch, And Dinner Recipes With No Meat Or Dairy - khususia. This recipe looks great-will surely try it. This recipe has me counting down the days until brunch! Although this is a breakfast skillet, it could not have shown up in my email at a more appropriate time. I was planning on roasting some potatoes tonight to go with some salmon, and I think this would be a great upgrade. I’m sure the leftovers will be perfect for breakfast tomorrow 🙂 Thank you! I would definitely look forward to waking up to this! June 5, 2018 at 1:37 pm	 Holly L.
Didn’t have spinach so I used kale! Delicious, thank you! i think the vegan breakfast skillet would be very healthy if I did not contain 1/3 cup of oil which Is 100% artery clogging fat. 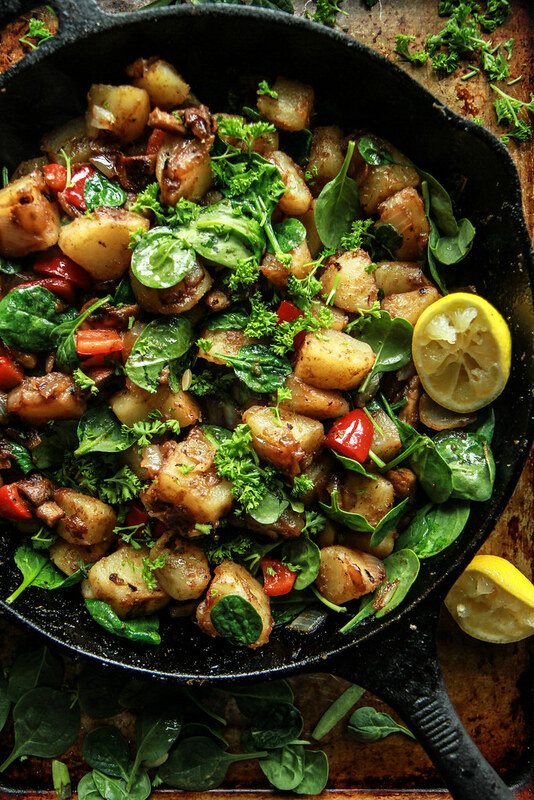 I love the combos of veggies in this recipe and I am going to fix it but I can successfully dry fry the pre cooked and cubed potatoes, until crispy on the outside in a good skillet and saute the rest of the veggies in just enough veggie broth to cook them and add it all together to have a very healthy breakfast which I am going to do. Try it. It is easy and much healthier for your heart and arteries as well as weight loss. We had a birthday brunch for my twins yesterday and I made this for my vegan sister. So yummy! Everyone liked it, recipe was shared, and is now a an addition for all of us….not just the family vegan. Thanks! I made ththiththis and it came out so yummy! However I didn’t have paprika so it did lack a certain something. What would you suggest for a alternative to putting eggs on top of this? Receipts listed you could add ingredient list at bottom so can keep count sugar protein, fats etc this would be very helpful for people who workout and need to keep carb and protein count. This was delicious. This dish was made for me for breakfast on Sunday, and I am going to make it this week. So simple and flavourful. Thank you for the recipe.